Are you looking for something to read on these dark winter days and evenings? Or perhaps a gift for your favorite dog-loving friend? 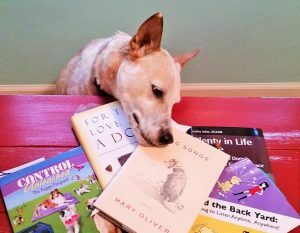 I have a long list of dog books that I’ve been inspired by, learned from, and even found comfort within. Here are a few of my favorites. I’d love to hear about your favorites too! For the Love of A Dog, by Patricia B. McConnell, Ph.D. This fantastic book is written by one of my all-time heroes in the dog world. I like to ready anything she writes, but this is one of my favorites. For the Love of a Dog discusses the emotions of both humans and dogs with a balance of science and spirit. Published back in 2005, it still provides an enlightened view of how and why we love dogs the way we do. changed her entire thinking about training. I consider this a must read for all of us who are involved in training our own dogs, or in helping others train their dogs. Beyond the Back Yard: Train Your Dog to Listen Anytime, Anywhere! by Denise Fenzi. New this year, this book lays out a great program for distraction training and bringing your dog’s skills from the training arena to the real world. Those who have worked with me over the years and especially on distraction training will recognize the concepts. But this book is clear and specific, with step-by-step exercises to take you to the next level. Control Unleashed: The Puppy Program, by Leslie McDevitt. Not just for puppies! The exercises in this book build skills for that calm, focused dog that we all want to live and work with. Though written as a puppy book for dog sport bound puppies, this is really a foundation training program that builds skills for self-control and arousal regulation in dogs of all ages. Dog Songs, by Mary Oliver. OK, not a training book (if you can believe it), but a collection of poems about dogs, dog love, and the bonds that bind. Dog Songs reminds me that life with our dogs is not about how well our dogs sit or come, but rather that our shared experiences are what really matter. What are your favorite dog books? Do you have a novel or mystery or training book you like? I’d love to hear about it.